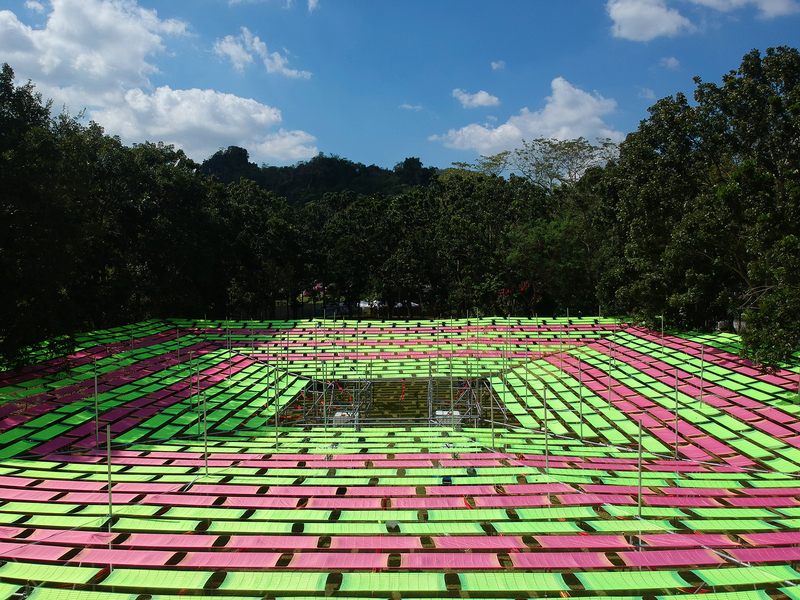 Using Khmar cloths to build a pavilion’s roof is not new for us, neither creating a hammock space. 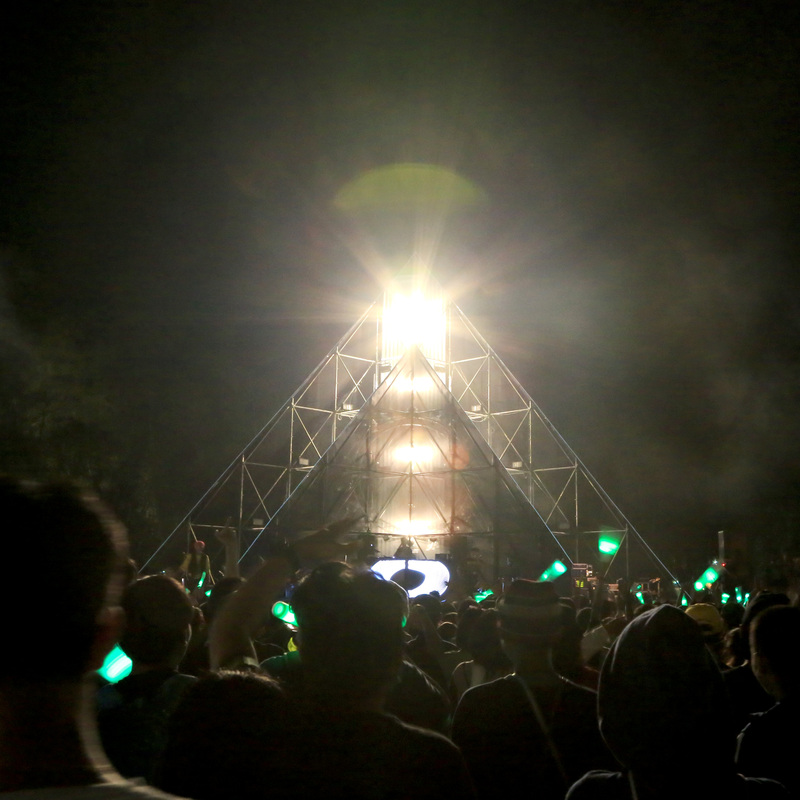 But combining the 2 ideas is our first time and it is meant to be here in BMMF9. 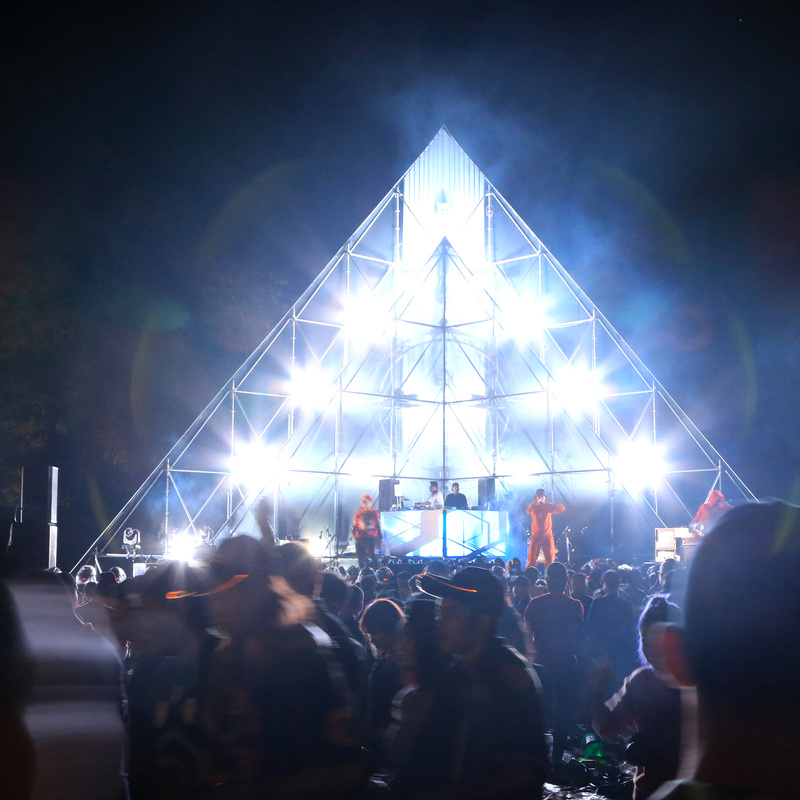 We are happy to see this element re-appearing in the event as it is one of the original elements created since the 1st edition of Big Mountain Music Festival back in 2010. 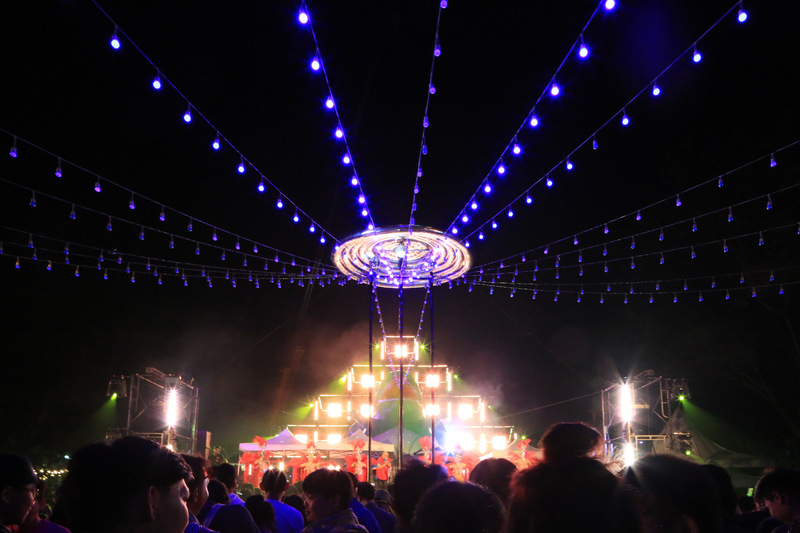 Typically our Khmar market have been built using bamboo tided with PVC rope, a very traditional temporary way of erecting such structure. But because of the site constraint, we have to change it to a steel scaffolding and pipe system which save time and damage ground condition less. 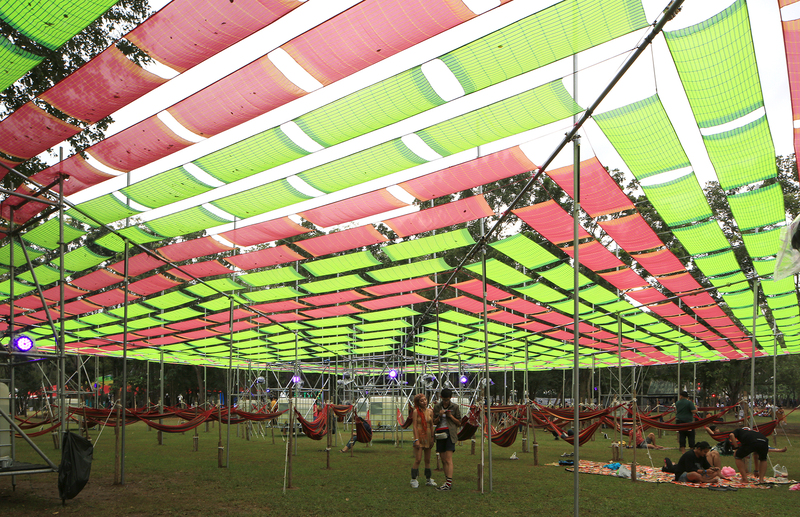 1080 pieces of cloths are hung in pattern creating shading for 72 hammocks below. UV lighting is installed to create a dim atmosphere where fluorescent stripes on the roof shine. 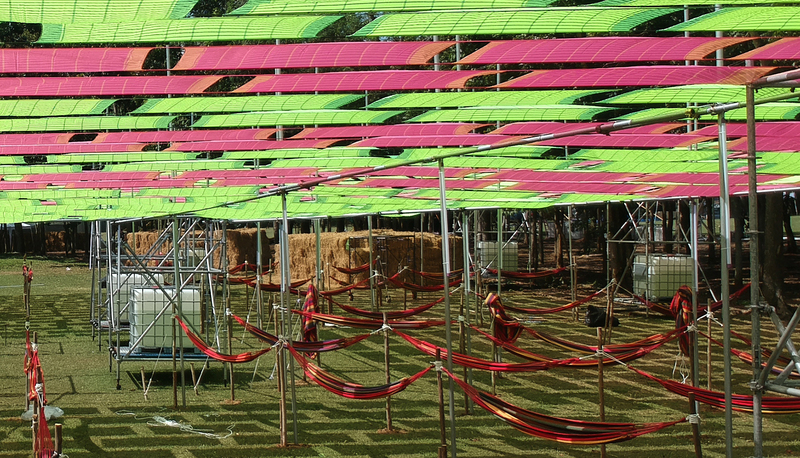 The Hammock market is placed in front of food stalls making it a space for people to relax after eating. 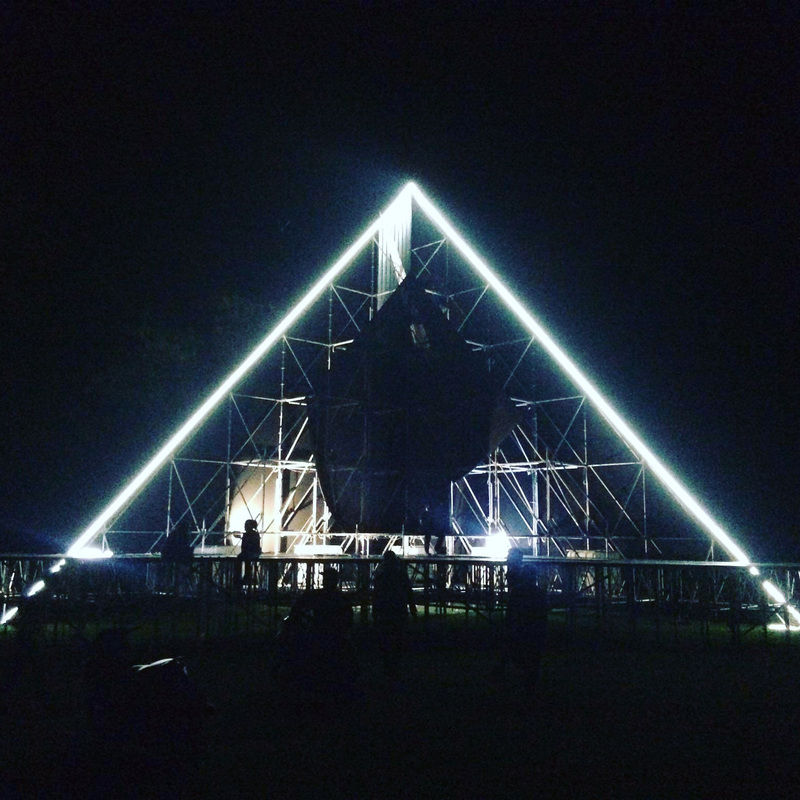 A lot of people spend the whole night here after long days of music. 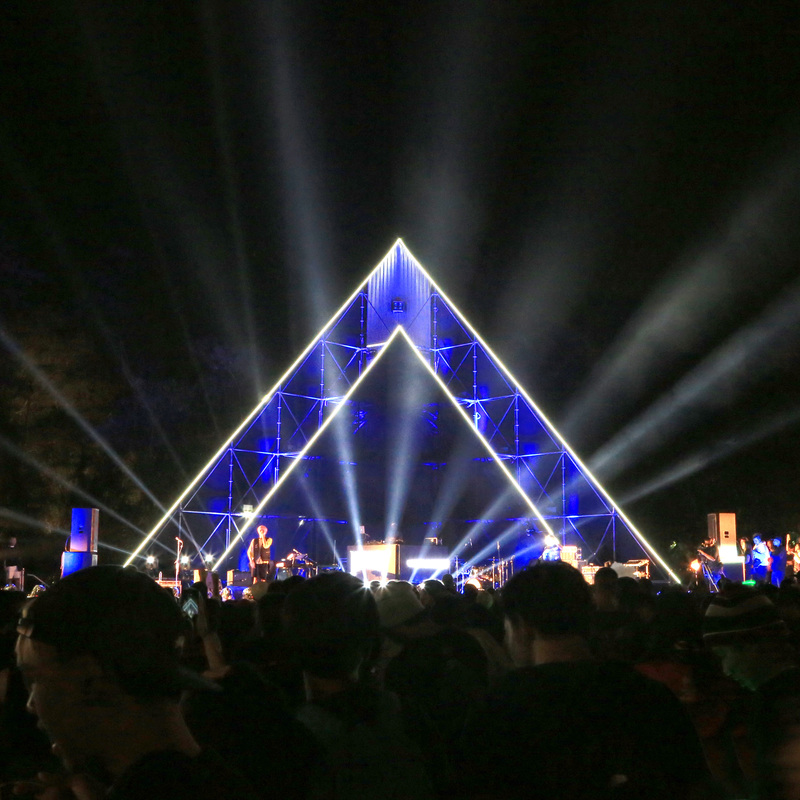 Big Mountain Music festival is truely meant to be for every one. 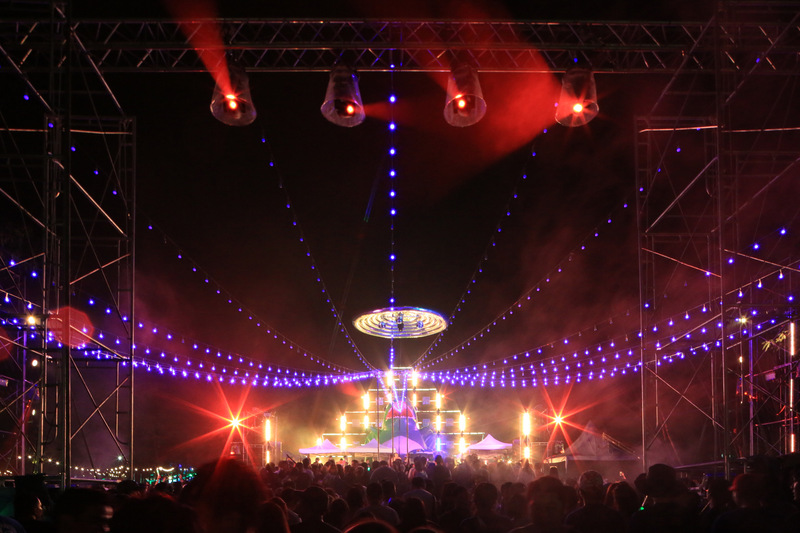 In its 9th edition, there are music from almost all Genre across 10 stages. 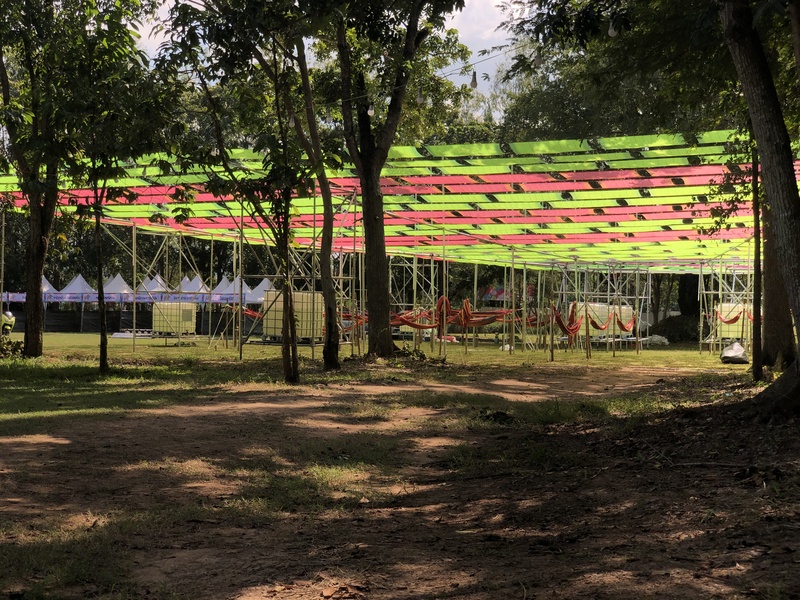 One of the stages that emphasizes this mindset is a stage called “Secret stage” ran by Trasher, a Thai party organizer famous among LGBT group. 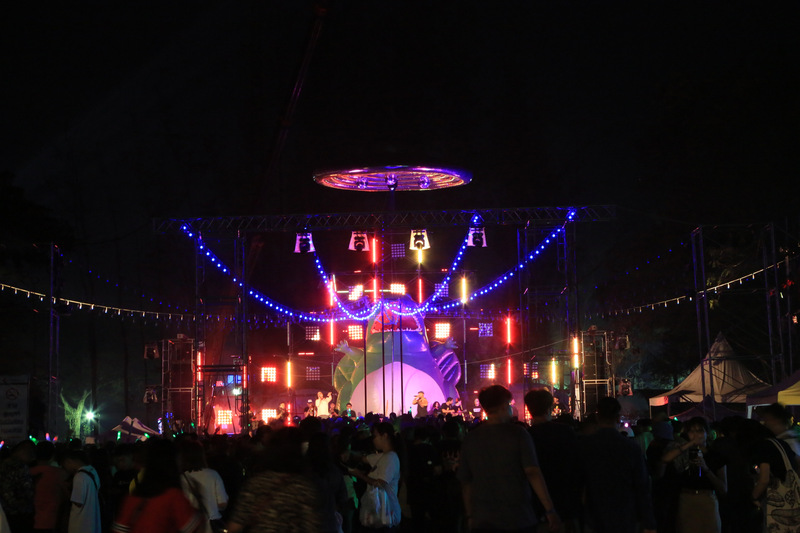 The model of this attraction is an evolution from Soi 2 stage appeared in BMMF3-BMMF6, a dance show-based stage with DJ in the center. The design is largely inspired by 1966 American Sci-fi movie, Fantastic voyage which is a story of a shrunk microscopic submarine that travel inside an injured scientist. In the movie, there are scenes showing the crews traveling into human’s vain and organs fighting with unwanted entities that cause disease. Our idea is to hide the enclosed stage behind the toilet units as main idea is to make it a hidden attraction. 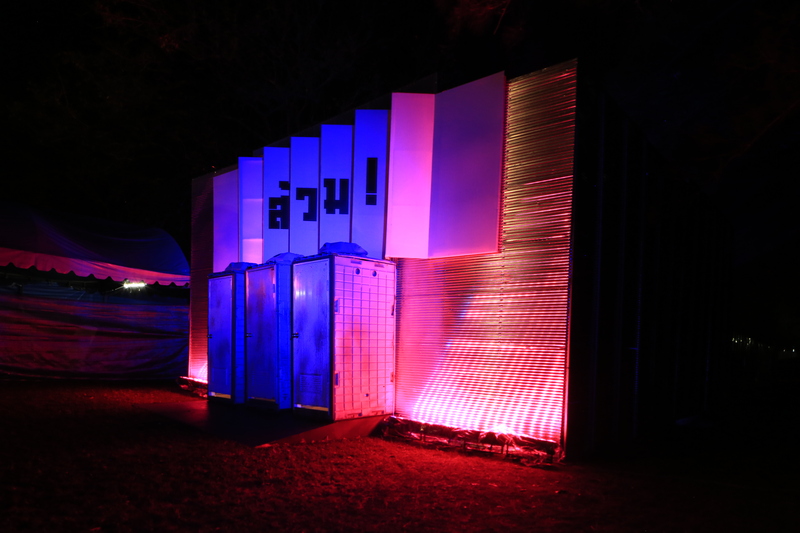 Once entering the toilets door, people will go through a tunnel of stretched fabric flooded with dimmed black light. Then they will be directed to the main pub space where the stage on the other end is the main focus. 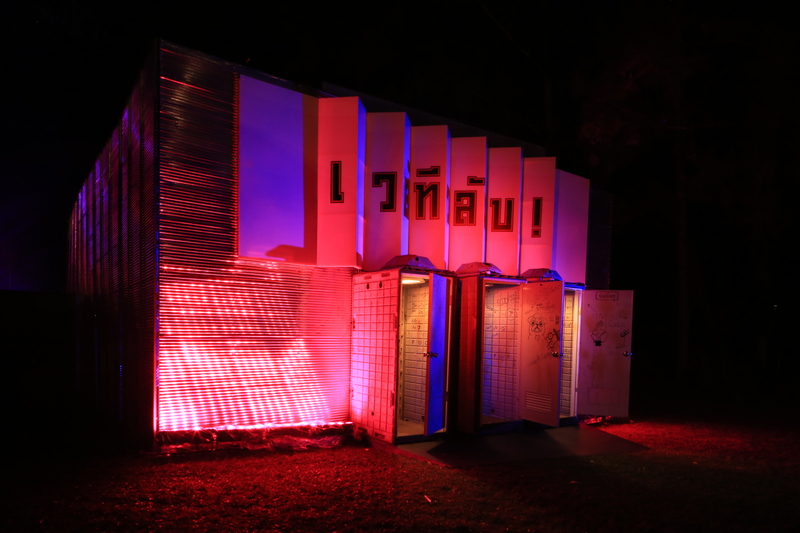 The main entrance of the stage is a 3 standing toilet units put in front of a corrugated zinc wall. 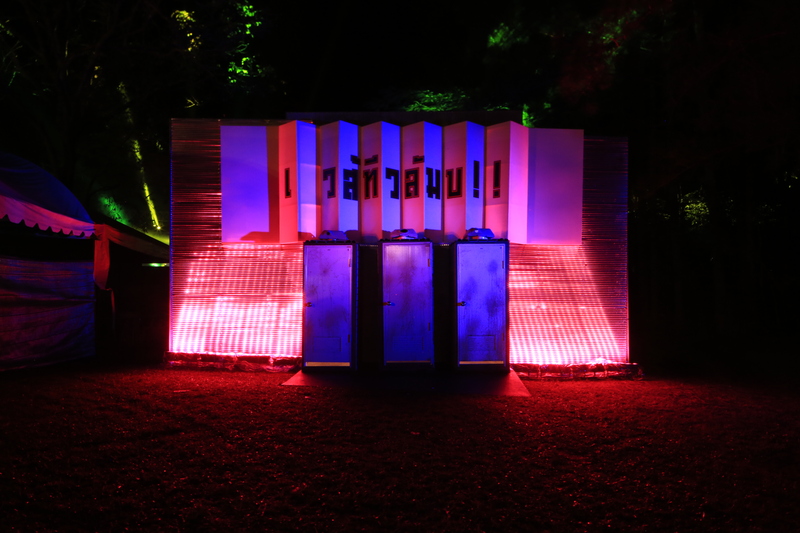 For the stage, it takes a very primitive approach referencing a stage construction of Thailand’s traditional play, LI-KAE. 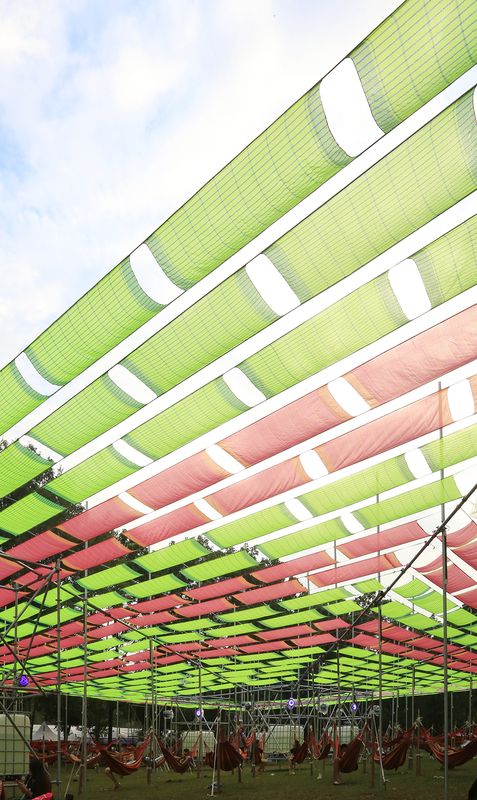 It is composed of multi-layered painted curtain. With painted graphic on it, the backdrop creates an perspective illusion of a grand room in palace suiting LI-KAE stories. Our version of Secret stage back drop is printed with intestine graphic simply to suit a voyage into the body theme. 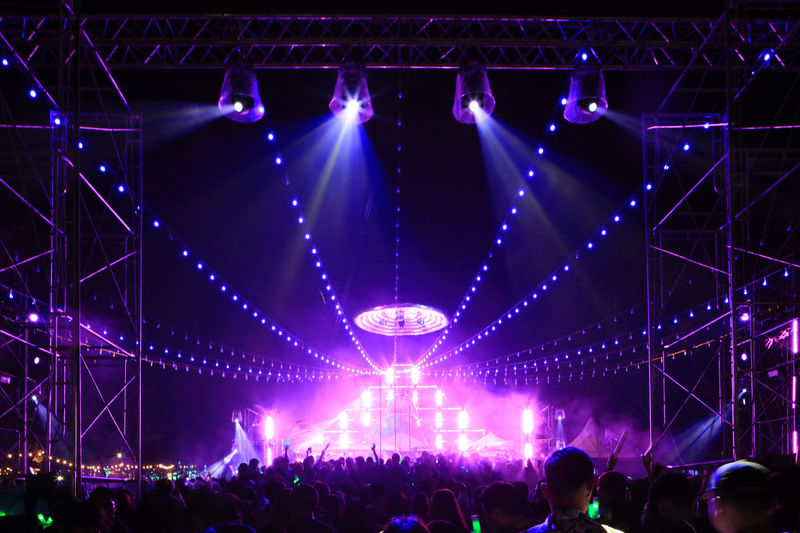 However lighting placement is configured not in LI_KAE’s way but clubbing configuration. DJ booth is set in the center decorated with fresh thousand of bananas making it feel like he is performing in a pile of fresh fruits. 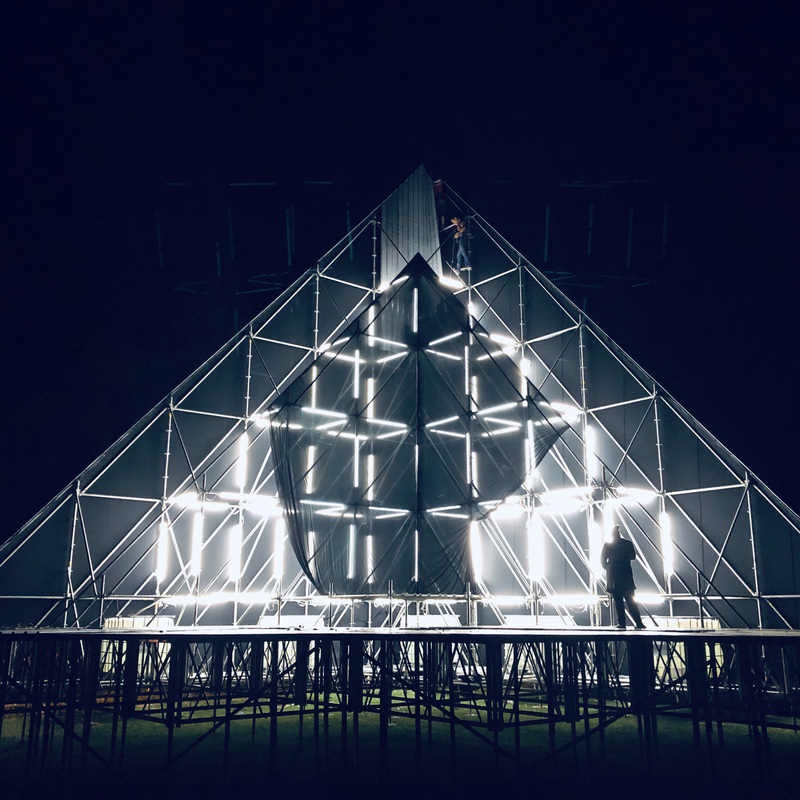 Our design approach is to make a very subtle backdrop in triangular shape yet can be transformed to an aggressive/active scenography that suit hip-hop genre. 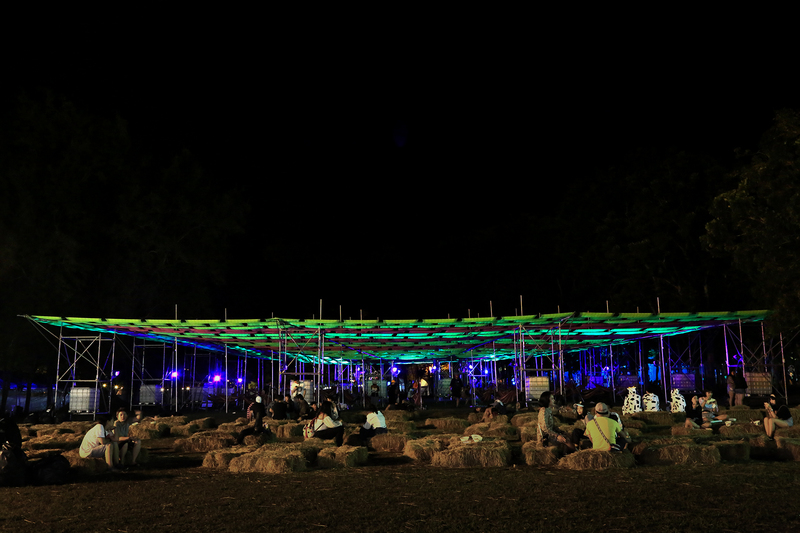 The backdrop is simply composed of 2 pieces of stretched black curtains over-layed on steel scaffolding system. The blackness of the fabrics is enough to hide presence of lighting fixture and translucent enough for light to emit through. 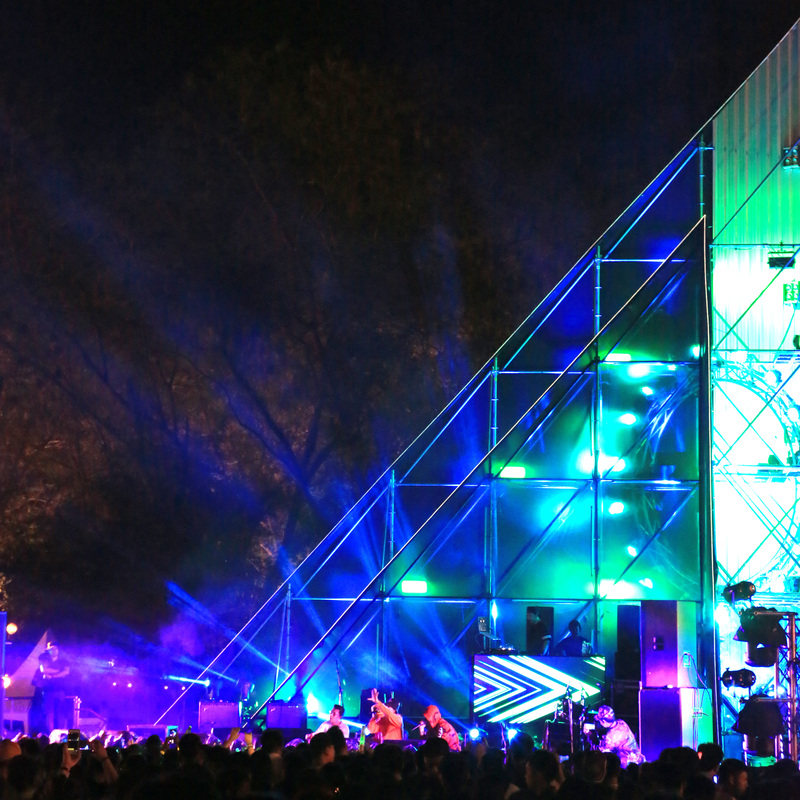 During daytime the stage is almost like a black pyramid standing on a green field, while during the night, energy is transmitted to audiences in the form of lights. 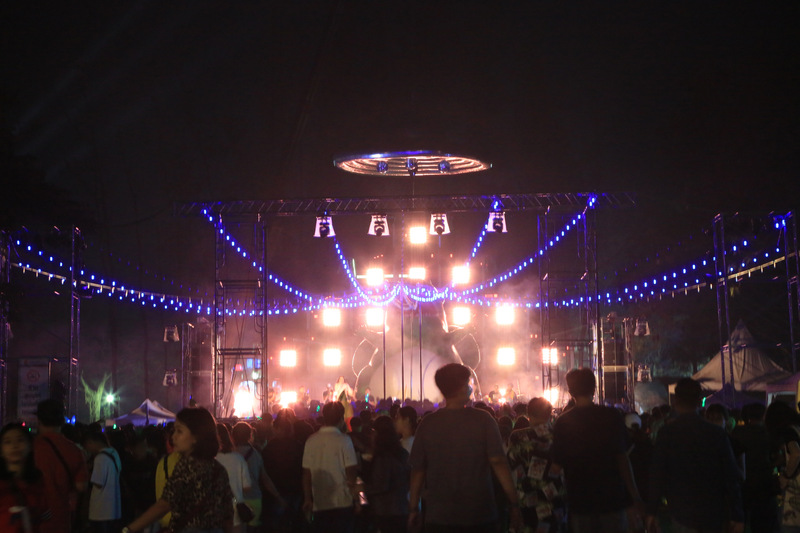 For 9 years in a row, Cow stage has been featured in Big Mountain Music Festival. In fact, it is the only thing that is redesign and built in all 9 editions of the event. 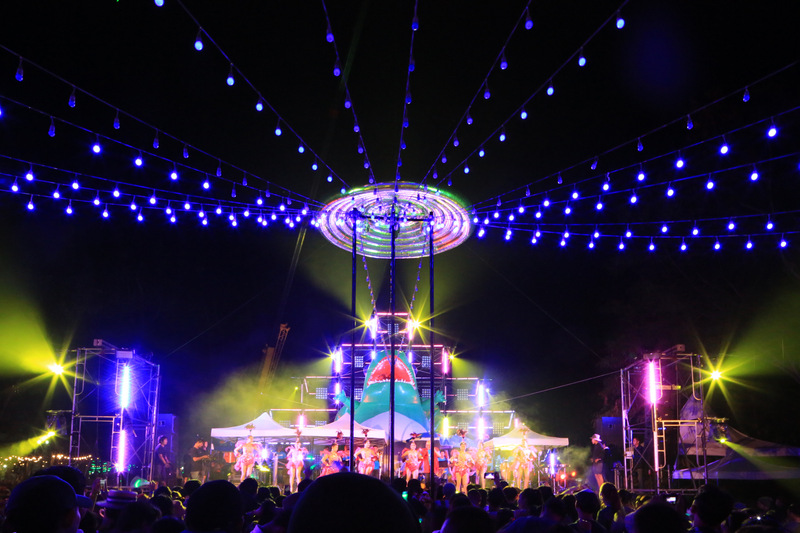 9 years old, Cow stage has evolved from hand-powered mechanism into a fully digitally control installation that enhances performances of artists on stage. Nostalgically, we still miss those days when a bunch of stage men had to control movements of the Cow’s head, its mouth and changes of eyes expression. But life goes on… Today’s edition of the Cow has totally embraced new spirit. 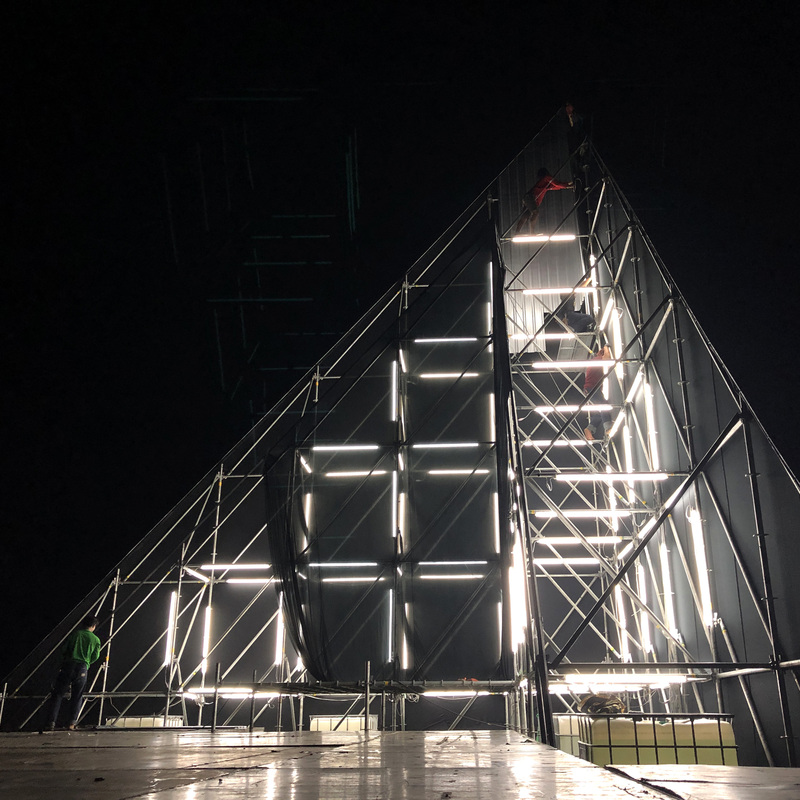 Diversity and technology: As mentioned before, the Cow robot’s performing mechanisms like eyes and hand have been replaced by digitally controlled LED panel, they are the main means that create diversity for the shows. 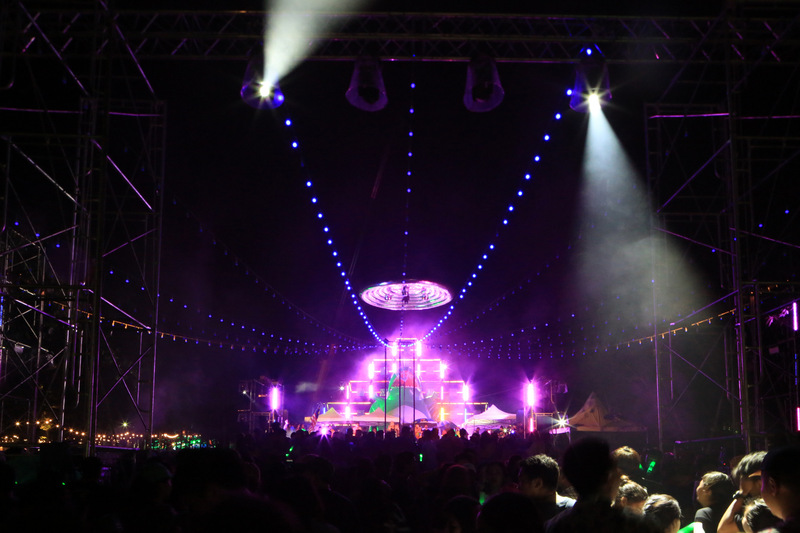 Mainly, artists playing on this stage are pop to easy listening genre, communication design is also meant to be easier to comprehend rather than experimenting.